Diets like these trick consumers into thinking they are forming a healthier relationship with food. Though weight loss is de-emphasized, a trio of restriction, fear, and control are in the driver’s seat and could potentially steer dieters toward a downward, disordered-eating . 1: It is focused on "can" and "cannot"
The Whole30 targets perfectly nutritious foods for most people (grains, beans and legumes, and dairy) as foods to avoid entirely, relegating them to the same level of value as boxed mac and cheese, frozen pizza, and Kool-Aid. And most bodies are perfectly capable of handling these foods. They provide a convenient, affordable, and satisfying means of getting calcium, vitamin D, potassium, phosphorus, and nutrient-dense protein. The Whole30 eliminates almost all the plant-based protein options for vegans and vegetarians. While the point of eliminating these foods, creators Hartwig and Hartwig explain, is to reduce inflammation and improve gut health, nowhere in the book or website do they provide scientific studies that show removing grains, beans and dairy does this for most people. But we'll get to that later. While no one is arguing that consuming less sugar, MSG and alcohol are unsound health goals, making the message one of hard-and-fast, black-and-white, “absolutely don't go near or even think about touching that” is an unsustainable, unhealthy, and inflexible way to relate to food for a lifetime. 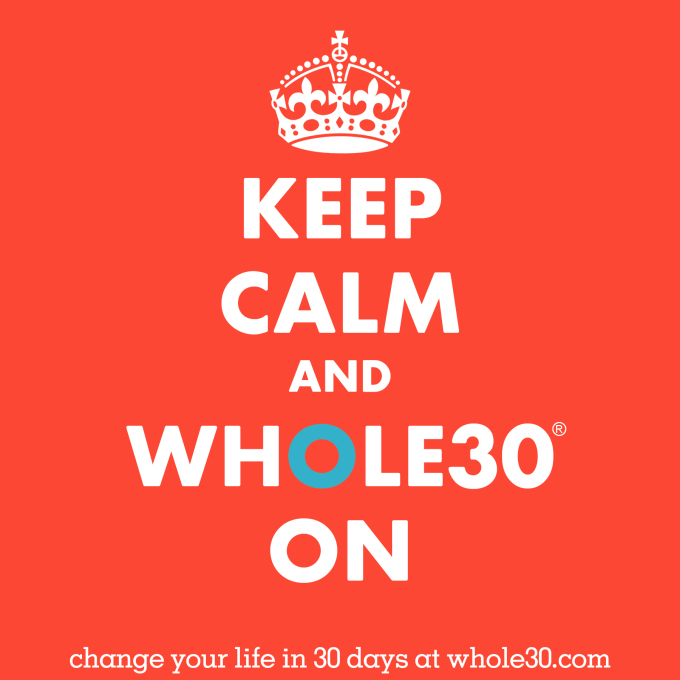 After eight years of existence, the Whole30 now comes with a pretty widespread social-media support system. There is plenty of research to back up social support in any major lifestyle change as a major key to success. Thanks to this, more people than ever before (like my friend Lucy, who participated alongside her engaged sister) can make it through the 30 days without "failing." Should the average Joe looking to improve his nutrition need to scour the internet for "compliant" recipes and plan every meal of every day in advance? While the Whole30 may help those unfamiliar with cooking wholesome, unprocessed meals at home jumpstart a healthy habit, learning about cooking, especially for beginners, should be flexible. It doesn’t have to come with a rule book. In fact, I think that's inviting entirely too much brain power that could be used in so many other unique and fulfilling ways to be spent thinking, worrying, and obsessing about food. Food is important, but it is only one facet of wellness. The Whole30 seems to brush aside the intractable and significant influence of stress in favor of a “perfect” diet, which may or may not be nutritionally adequate, anyway. The language used by Whole30 creators to rationalize the rigidity of the diet could make anyone feel like a chastised puppy in the corner. "It's not hard," they say, and then proceed to compare its difficulty to losing a child or a parent. Okay, sure, compared to a major life stressor, altering one’s diet is a walk in the park. But changing habits is hard work that requires mental energy every single day. Eating, and choosing what to eat, is a constant battle for many people and it doesn’t have to be. Life is hard enough without diet rules. The last thing anyone needs is to transform a natural and fulfilling component of it (read: food) into a mental war zone with contrived rules and harsh consequences. When was the last time you overheard a stranger complain about healthy eating being expensive? Most likely, the protester was envisioning a diet akin to the Whole30. Grass-fed beef, free-range chicken, clarified butter, organic produce...no dry staples like beans, rice or peanut butter. Healthy eating does not exist on a pedestal. It does not have to be expensive, but it certainly can be depending on where you choose to (or can) shop. Let’s set a few things straight: You don't need grass-fed gelatin powder in your smoothies to be healthy. You don't need organic coconut oil to be healthy. You don't need exotic fruits and free-range eggs to be healthy. Maybe these foods mean more than just nutrition, signifying important changes to be made within our food system. But it terms of nutrition, sometimes the best a person can do for himself and his family is buy conventional produce, whole grains in bulk, and Perdue chicken breast on sale because otherwise they would be running to the drive thru or microwaving a packet of ramen noodles for dinner. A diet like the Whole30, which emphasizes foods of the “highest quality,” does nothing more than shame and isolate those who can't sustain the standard it imposes, further cementing their belief that healthy eating is unattainable. But it is just a month—certainly anyone can abstain from these type of events for a mere 30 days (remember, "it's not hard")—but then what? Do you just return to your normal patterns? Or do you, more likely, go back to them feeling so cheated from a month of restraint that you drink and eat so much more than you might have if you'd maintained a sense of moderation? Most of The Whole30's success has come from word of mouth, stories, and endorsements from those who successfully made it through the program and felt “better" afterwards. The website, dismayingly, does not house a single citation or study referenced in creation of the diet. It’s important to note that the Whole30 did not exist 20 years ago. The Whole30 is not a pattern of eating that is replicated in any society on earth, and it doesn't seem to be based off any research suggesting that it is indeed a superior choice. At the end of the day, this is a business, created by Sports Nutritionists (a credential anyone can get by taking an online test, regardless of one’s background in nutrition—which neither of them has) part of the multi-billion-dollar diet industry. Pinpointing three major food groups as causing inflammation and hormonal imbalance is quite an extreme statement to make without any research to back it up. What does the science actually show? Knott, who counsels clients in her Tennessee-based private practice reminds us that, "consuming a plant-based diet, including grains and beans/legumes, is known to contribute to a lower risk for chronic disease like heart disease, cancer, and diabetes. Grains and beans/legumes are a source of fiber, protein, and B vitamins such as folate. They’re also a source of phytochemicals which may play a role in cancer prevention." The Whole30 proposes eliminating grains because they contain phytates, plant chemicals that reduce the absorbability of nutrients like magnesium and zinc in our bodies. While it’s true that both grains and legumes contain phytates, so do certain nuts and some vegetables allowed on the diet, like almonds. It is possible to reduce the amount of phytates in an eaten food by soaking, sprouting, or fermenting grains and legumes, but research from within the last 20 years suggests that phytates may actually play a key role as antioxidants. In a diverse and balanced diet, phytates in foods like grains and legumes do not present a major micronutrient threat. Further, new findings from Tufts scientists provide more that whole grains in particular improve immune and inflammatory markers related to the microbiome.